The Brooklyn and Manhattan Bridges, both connectors across the East River, have succumbed to separate development controversies; each revealing a uniquely New York socio-economic subplot, with the same outcome. A long story short: A medium size development called Pierhouse is being built next to the Brooklyn Bridge. It’s a fairly low lying structure, short by Manhattan standards, but it blocks the view from the Brooklyn Heights Promenade. It has gotten the community of Brooklyn Heights up in arms because the beloved view of the Bridge from the promenade has been compromised; A justifiable concern when, as city dwellers, access to space is a precious commodity. 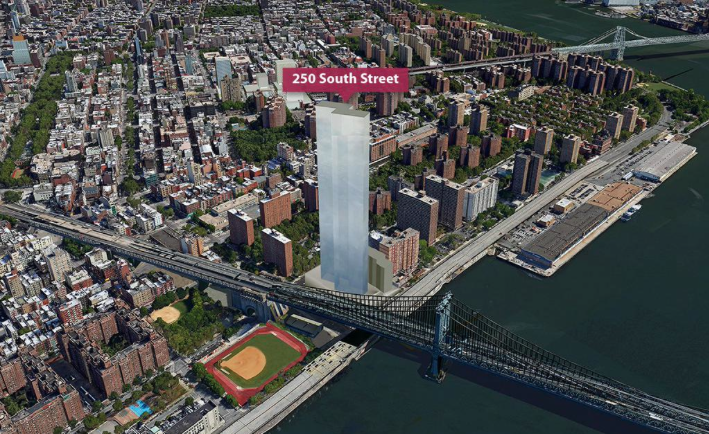 Just up the river, The Manhattan Bridge is getting its own neighbor in the form of an 80 story Monolith Tower. A gated luxury villa replete with a now banned “poor door” for lower income residents. The controversy surrounding this development involves the encroachment of the market rate consumer into a below market rate community. Another justifiable concern. The controversies surrounding the two developments have been puzzling to say the least. The realization of the Pierhouse “view blocking” debacle came after the building was mostly built. The community rallied (without success) when the structure was almost topped out. The Monolith Tower of Manhattan Bridge has been shrouded in secrecy since the day the development plans were released. There has been no coherent rendering of the entire project, only hints to its size, its discriminating entry sequence and vague references to a “luxury market rate product” coming to the Lower East Side. Viewed from differing perspectives, these developments and the controversies surrounding them makes one wonder how “value” is placed on the Landmarks of New York, our public green space, and surrounding communities? And how is this “value” regulated? These perspectives are manifest both internally (from the inside looking out) and externally (from the outside looking in). Internally, because the Manhattan Bridge Monolith is being shunned on all fronts by the neighboring community. As much of a boon it will be to its surroundings (a new grocery store and affordable housing complex are included), it has almost been universally rejected by the neighboring residents of Chinatown and surrounding housing projects (for good reason) because it is new, and it is huge. So while this thing is forging ahead with the mighty backing of The Developer, it makes one wonder if regulations could have been put into place to mitigate such a disaster from happening. Because now, it is apparent that any existing regulations are being blatantly manipulated. 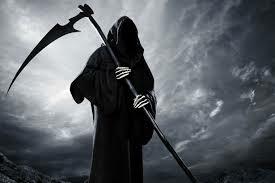 This is an internal cry from the community that something must be done. Externally, the same goes for the Pierhouse development across the way, where the neighborhood is crying wolf after the fact. With very legitimate concerns about the right to public space, light and air, and the Urban Benefits of our park systems for all, it makes one wonder, again, what could have been different? Where was the breakdown in process and dialogue and why is this discussion being projected onto a building when it is already there? So, while the political and economic contexts surrounding these two projects differ (one is in the rich area and one is in the poor), the rallying cry behind their wreckage must be assessed through a redefined lens; One that does not view The City in hindsight. Because in this particular Tale of Two Bridges, everything has transpired “too little, too late”. Brooklyn Bridge Deserves a Scenic District of It’s Own, from Curbed. 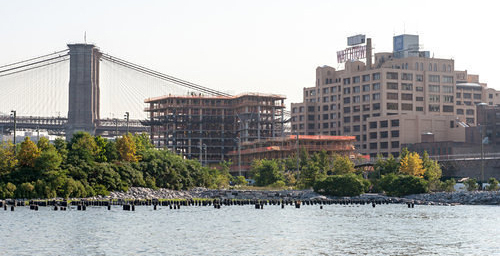 Brooklyn Bridge Blocking Pierhouse is Allowed to Keep Rising, from Curbed.